The First Line of Jaipur Metro Project is Complete ! Jaipur! 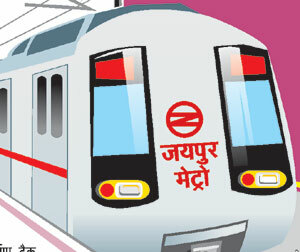 The city of Rajputanas is now extending its name to metro city as the “Metro Rail project” is gearing up in Jaipur explicitly. After two years of up-downs and uncertainty, Jaipur’s Metro train project is finally ready to hit the tracks. The Delhi Metro Rail Corporation (DMRC) and Jaipur Development Authority (JDA) are the joint nodal agency for this venture which would start work for building the stations and railway lines for the first phase of the project. This project is concentrating on two routes. The First route of Jaipur metro rail will connect Mansarovar to Badi chaupar via Civil Lines and Chandpole. The length of the route is 9.2km. The approximate number of passengers expected is approx.2 lac per day and the frequency of the metro which will run on this track is estimated to be every 6 minutes as per plan. The second route will connect Durgapura to Ambabari via Ajmeri Gate and MI Road. The tracks will be elevated till Ajmeri Gate and then will go underground. The length of this route is 23km. The approximate number of passengers is expected approx. 4lac per day and the frequency of the metro which will run on this track is estimated to be every 5 minutes. As per the data the total number of stations touched by metro is 29. And the present situation is that Construction of the first part of the first line is complete which is from Mansarovar to Chandpole, started on November 13, 2010. Jaipur will be first city in the country to have an elevated track for the Metro and the Bus Rapid Transport System. While the Metro would run on the elevated track- the two tracks below it would be reserved for the normal city traffic. So, Jaipurites be ready to be proud on your city and its growth!! Previous Post Metro station and platform at Chandpole ready !